ABC: THE BACHELORETTE up 0.02 to 1.4, THE PROPOSAL steady at 0.7. CBS: SALVATION down 0.1 to 0.3, preceded by reruns at 0.4-0.6. 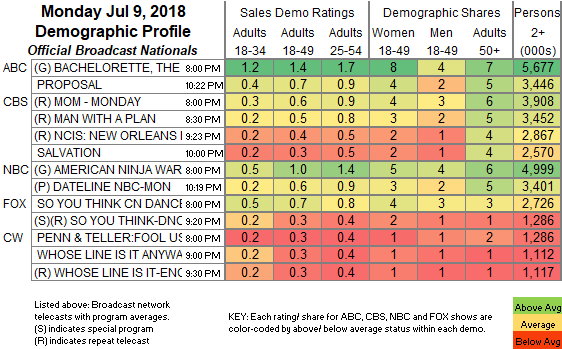 NBC: AMERICAN NINJA WARRIOR up 0.3 to 1.0, followed by a special DATELINE at 0.6. FOX: SO YOU THINK YOU CAN DANCE up 0.1 to 0.7, followed by a rerun at 0.3. CABLE HIGHLIGHTS: VH1’s LOVE & HIP-HOP led Monday cable, up a tick to 1.05. USA’s WWE telecast was at 0.80/0.79/0.75, compared to last week’s 0.90/0.90/0.85. On MTV, TEEN MOM gained 0.08 to 0.78, with the lead-out season premiere of FLORIBAMA SHORE at 0.54, and an AFTER-SHOW at 0.27. On Discovery, STREET OUTLAWS lost a tenth to 0.57, and AMERICAN CHOPPER returned at 0.32. Not unexpectedly, the Supreme Court announcement was huge for Fox News’s HANNITY, which owned cable news at 0.56/0.96/5.8M, with CNN’s CUOMO PRIME TIME at 0.34/0.45/1.6M, and MSNBC’s RACHEL MADDOW SHOW at 0.27/0.39/2.4M. On HGTV, HOUSE HUNTERS INTL edged up 0.02 to 0.34, HOUSE HUNTERS ticked down to 0.33, and LOVE IT OR LIST IT was steady at 0.33. On Food Network, WEDDING CAKE CHAMPIONSHIP climbed 0.02 to 0.31, and RIDICULOUS CAKES was at 0.23/0.20. On ID, PEOPLE MAGAZINE INVESTIGATES dropped 0.06 to 0.18, REAL STORY returned at 0.26, and THE LAST 24 was down 0.04 to 0.21. On History, AMERICAN PICKERS was at 0.24. 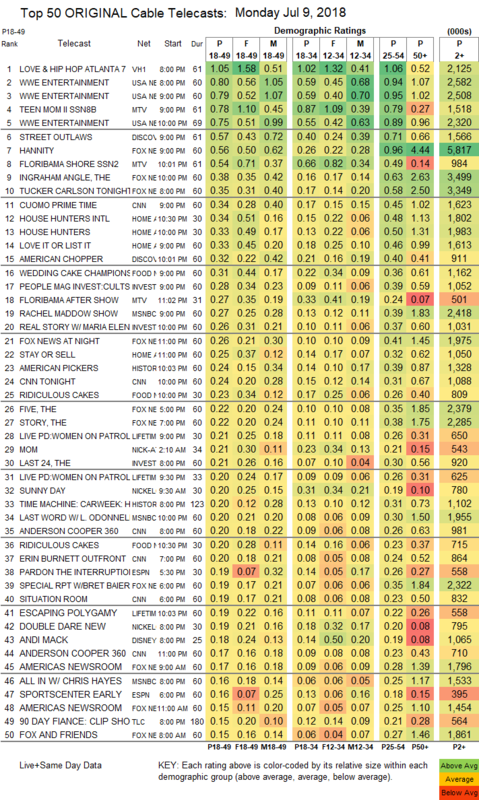 On Lifetime, LIVE PD was at 0.21/0.20 compared to last week’s 0.19/0.18, and ESCAPING POLYGAMY was up 0.03 to 0.19. A&E’s CULTURESHOCK fell 0.07 to 0.11. Freeform’s DISNEY’S FAIRY TALE WEDDINGS ticked up to 0.09. AMC’s DIETLAND remained at 0.09, and UNAPOLOGETIC was up 0.02 to 0.05/150K.